What a difference a year makes. I’m volunteering again this summer for the Virginia Working Landscapes, a project through the Smithsonian Institution that studies the importance of Eastern grasslands and their associated wildlife. My job is to identify and tabulate the grassland birds, and after a year of birding practice I’m feeling much more confident in my abilities to identify bird species by sight and sound. This year, one of my study sites transitioned from a monoculture of barley to a field of wildflowers, and what a beautiful sight it is now! Although the birds are just starting to resettle the field—Eastern Kingbirds and Goldfinches leading the way—it’s been a joy to watch as the field completely devoid of birds has now become a home to those that catch insects and feed on the abundant thistles, with a few raptors thrown in for good measure. 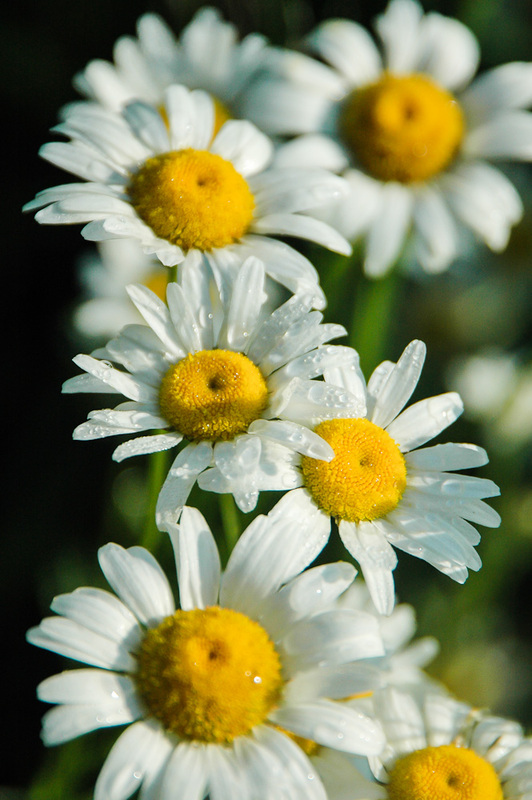 I always carry a camera on the survey, and on this morning I focused on the daisies, which grow about three to four feet tall. We must wade through them to reach the study sites, and it feels like swimming through flowers as the dew collects on our clothing. I don’t mind, though. Last year we stayed dry walking through the evenly spaced rows of barley, but it wasn’t nearly as beautiful or bountiful. Excellent photo Tricia!! I can only imagine what it must be like to walk through a whole field of daises! It was pretty awesome! But with the morning dew it was a very wet walk! Beautiful – thanks for sharing this experience and the lovely photo!